Got to Get it Together Here! I have a terribly wonderful problem! Actually it’s two-fold and causing me to really have to get it together. I picked up a third client to write for…that means my work load has really increased. That is the wonderful part because the more I write, the faster I complete projects the more money I can make. Then there are days like yesterday where I just get bogged down in the emotions of the situation and have such a diffcult time nailing down discipline! And I was really tired too…that was a terrible combination that worked against me! I have to figure out how to discipline myself even through the stress of each day. I’m sure if I get hungry enough it will motivate me to work harder! lol! The other side of the “problem” that has a positive aspect as well – is that Chris is getting better. He’s awake longer through the day and much more aware of his surroundings. I don’t want to sit at the computer all day and miss working with him like he needs…Add that together and then I stress out — then nothing gets done lol! It’s really become a balancing act. I work awhile then feed Chris, let him rest a few minutes while I work on a project. Then I stretch his arms (which he seems to actually like) then while he rests for awhile I work some more.. and that goes on pretty much all day! It’s like living in a three ring circus!! I must trust Him for each day.. as it comes..and goes…so I will continue to do so.. while I say a quick prayer of thanksgiving for His provision… then gotta get to typing!! I know I still have another day to go until I get to Monday – but as any of you who might read more than one or two entries know weekends can be a tough time. There’s no “break” in the day since the aid doesn’t come and sometimes the only voice I hear is my own. I have to be careful or I will start dreading the weekend. Chris is doing good too – that always helps. Plus I actually talked to several people on the phone today and that helps too… I’m sure Chris gets so tired of just hearing me talk. It’s kina funny and I think I am old enough to blame it on age but I talk to Chris so much that I’ve got to where I just talk all the time. Like when I am in the kitchen and he’s in the bedroom.. just keep on talkin’! Oh well…. Anyway it also helped that my nephew, Jakob, came by for a few minutes last night. He nearly go shot, but it was good that he came by! Usually I don’t have visitors in the evening and he didn’t call to say he was coming by. So when I heard my storm door open about 9 last night my first thought was “where’s my gun?” But he identified himself in time! lol! I think I may put my bo over by the door though! So I was thinking today about how difficult it is sometimes to keep faith when Chris is sitting here. I see the progress and I get so excited. And really the last couple of weeks somehow seem like he’s made a lot of progress in a short time…that’s encouraging. But then I look up and he’s drooled on himself…and I lose it once again. It’s this seesaw thing that goes back and forth pretty much all day everyday. But in my thoughts today I was thinking about how at times it’s easy to believe, and other times it’s easier to let doubt creep in…but in my heart it’s much easier to believe than it is to continue in doubt…I am not sure how that works. And I know the medical professionals that work with us really don’t believe Chris is so much better. I don’t see them fighting to get him therapy even though I know he’s ready…because they don’t believe. That’s when I wish there was some button where I could push it and God would just raise Chris up and I’d say, “Now you see?” But then if there was one, I certainly would have pushed it a long time ago…And I don’t have any driving need to prove anything to anyone really. It’s their problem honestly..while I continue to wait on Him…and I think that is still the key – even though it makes me mad sometimes…not mad to wait, mad to know it’s the key! It’s getting late I gotta bolus Chris and then head to bed to get a little sleep before we get up at 5 and start all over again tomorrow…but the weekend is half way down. I asked Chris if he wanted to just have church with me again in the morning.. he didn’t say no! So I guess we’re on. Actually for those still reading this has a very interesting story, I think. 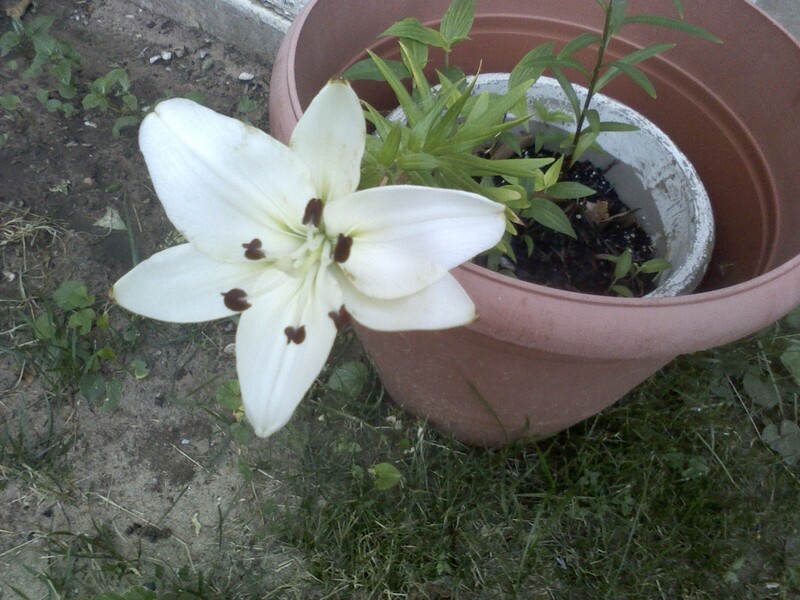 It was in the pot with the tulips that bloomed the day I moved in here. I left it because I knew it looked like a “real flower” of some sort. The lillies are gone, then the roses bloomed. After they stopped a gorgeous orange daisy came up near the edge of my garden. It’s just about done its job and I’ve been watching this bud for a long time…just waiting. Then last night it looked so pale. I wondered if there was something wrong with it and I was saddened to think it might not get to bloom… that’s why it was such a shock this morning when it was standing out there so beautifully! The Doctor Comes Today…So What? Yeah, they actually skipped coming last month so I figured they thought they’d get us in on the first and it would count for something. I used to get all these questions together before they come…now I just don’t care. It’s funny how repeatedly they can let me down until all confidence in them is gone…and they don’t even know..or care. so I’m taking my new “friend” to take her dog to the vet this morning. It’s becoming an interesting situation with her. I go to two very different extremes about helping her this morning and I’m still trying to figure out how to balance it all out into something that makes sense. For one, I am really excited about getting help someone else!! But the flip side is that it takes the only time I have for my own errands! …then I feel guilty for being selfish at all…it’s crazy. It’s also a pattern with her that I will have to watch as she has called me 3 times now and each time “desperately” needs something…but hey – it’s still good to get to help someone else! Chris is doing real good! I simply love taking our walks in the park each evening. But now I’ve kind of adjusted our schedule so that we get to spend a little bit of time out back in the mornings. I push him out on the deck Randy built and he sits there (of course!) while I talk to my plants and water them and pull weeds. (don’t tell me you don’t talk to your plants!) It is quite an enjoyable part of our day! I love seeing the wide variety of birds that come to visit the feeder and I keep a field guide here close to the computer to identify new sightings! It is just nice, you know? Another good thing is that I have a new client too. I think I have actually become a writer! (shocking, I know…) I am having to discipline myself to keep up with the three clients that I have now. My ultimate goal is 5. I dont’ know why –that just sound right! It might be tough though. I think after I adjust to the increased workload of these three though I’ll be okay to go find another…It’s kind of cool, because if I can make a living like this eventually – I can live anywhere! …just a real freeing thought.. no plans of going anywhere! It is difficult trying to get all of the things in for Chris each day and do all the writing too. I don’t want to cut back on the things I am doing with him just to make money.. but I don’t want to work with him sitting in the dark either! lol! I have stepped up his “home therapy” and I also keep him up a lot longer during the day. But I also had to start setting an alarm to get up at 2 in the mornings to turn him again. Minor schedule change! He’s doing so good! And really – that keeps me going! I started a new bog last Sunday. It’s about how I am taking myself back. somehow along the way – taking care of Chris – I got lost…and I am on a journey to take myself back…to find myself once again…I think I’ll lik me when I get there! Check it out at www.ifieverfindme.blogger.com.